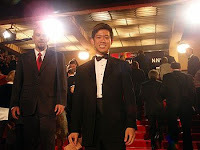 Yesterday, our DT correspondent Brian Tran (W'10) talked about the opening night of the 2009 Cannes festival and his take on the Pixar film Up. In today's post, Brian reviews some of the good and not so good films that people were buzzing about. Click here for the inside scoop! "Hollywood’s presence at this year’s Festival was definitely affected by the recent Writer’s Guild strike and the poor state of the economy. Parties were scaled down, the glamour was more restrained, publicity stunts were on the smaller side and there were only a couple Hollywood films in the Official lineup. Besides the Pixar offering, Up, Hollywood only brought two other films to the Competition: Ang Lee’s Taking Woodstock and Quentin Tarantino’s Inglourious Basterds. Sundance darling I Love You, Phillip Morris found its way into the Director’s Fortnight sidebar and Terry Gilliam’s fantastical Health Ledger starrer, The Imaginarium of Doctor Parnassus screened out of competition on the last Friday of the Festival. I was fortunate enough to catch all of these films during the Festival and some of the films certainly fared better than others. Taking Woodstock took a critical beating by the relentless Cannes reporters, yet I felt Ang Lee took the right approach to this film, detailing the comedic coming of age story of Elliot Tiber with tenderness and just enough psychedelic trappings to evoke the feel of the legendary music festival. Comedian Demitri Martin fends well for himself in the lead role, balancing the toll Woodstock is taking on his family life and his newfound popularity as the ringleader of the hippie circus that rolled into town. Although we never get to see much of the concert itself, that’s quite all right with me, given that you could always rent the documentary Woodstock (which incidentally also screened at Cannes in 1970) if you need a nostalgia kick. 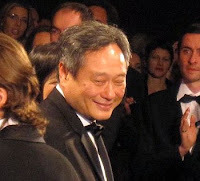 Ang Lee deserves this refreshing break from his recent darker material, such as Lust Caution and Brokeback Mountain. I Love You, Phillip Morris is gaining more attention as the “gay Jim Carrey film” and while that might be an accurate description of the movie, the filmmakers do not dwell much on the sexualities of its two lead actors, instead piling on the laughs in this improbable yet true story. Carrey plays a con man who falls in love with another inmate (Ewan McGregor) while serving time in prison. Before long, Carrey is breaking his lover out of the penitentiary using a variety of ingenious guises, each of which is more ridiculous than the last. The film seems to also have an identity crisis, like its main character, and it isn’t until the last reel does the film find its footing and delivers a tragic yet hilarious ending. 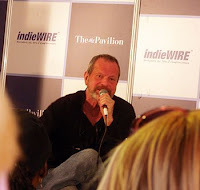 During an interview at the American Pavilion, director Terry Gilliam (see picture to right) explained the tremendous difficulties he and his crew had to overcome during the filming of The Imaginarium of Doctor Parnassus. Of course, this film will attract the legions of Health Ledger fans that undoubtedly will want to see the last footage of the late actor. Gilliam said that Ledger filmed about 50% of his footage before he tragically passed and Gilliam instinctively did not want to finish the film. He told the audience that he wanted to wrap that very day and put the film away for good, but he realized that Ledger would have wanted him to finish the film, in the most creative way possible. To do so, Gilliam enlisted the A-list trio of Johnny Depp, Colin Farrell, and Jude Law to film the scenes that were left unfinished. This works extremely well in the film and without knowing any of the backstory, I would assume that the film was written in this fashion. Unfortunately, I felt like the film relied a little too heavily on the effects to impress the audience as opposed to drawing them into the emotional world of the characters. The exposition was lengthy and convoluted and some of the characters seemed very one dimensional, not adding much to the plot or the other’s characters’ arcs. This is not a very showy role for Ledger and at times it appears as if he is channeling Jack Sparrow from Pirates of the Caribbean, which caused me to double take when Johnny Depp replaces Ledger in one scene. However, the film pulls it together for a thrilling final act that throws caution to the wind and turns everything on its head, which is fitting for the wonderland-like feel of the Imaginarium. Finally, the arguably most anticipated film of the Festival (or at least for me) was Quentin Tarantino’s latest epic, Inglourious Basterds. In his most international effort to date, Tarantino ambitiously films entire scenes in French and German, which nary an English word for large chunks of time. If it weren’t for the rag tag team of Jewish Americans led by Brad Pitt, I would be tempted to label this film as a foreign effort. Hopefully the subtitles won’t turn off too many viewers because I thought this was a fantastic return to form for Tarantino and it was a thoroughly entertaining romp through Nazi-era Europe. The film is broken into five chapters, each of which is really just one long scene. Tarantino’s witty and self-conscious dialogue translates remarkably well into other languages and the subtitles seem to have been written by Tarantino himself, with all of his humor infused in the words. Like Pulp Fiction, “Basterds” features multiple storylines that weave in and out of each other, culminating in one grand event that takes place in a Parisian movie theater which only highlights Tarantino’s self proclaimed love for the art of filmmaking. In fact, he uses the movies as a way to rewrite history and he is not above completely changing the end of World War II in the most graphic and strangely satisfying way. I’m being purposefully vague because I would not incriminate myself of giving away a single second of this film. I will say, however, to watch out for an actor named Christoph Waltz, who plays the sinister but poetic Nazi Colonel Hans Landa. Waltz never fails to steal every scene he is in and probably takes the cake for the best villain in recent cinema. He also won the Best Actor Award during the closing ceremony of the Festival, thus cementing his fantastic performance in history. 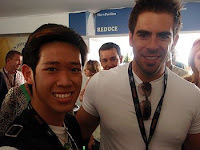 (picture above: Brian Tran and Hostel director turned "Basterds" actor Eli Roth)"
Check back tomorrow as Brian wraps up his experience in Cannes from this year and talks about something that caused him to squirm and scream!